Elsi is at present three years old. He is doing well and in good health. 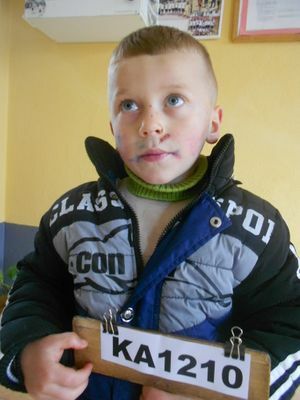 Elsi hasn’t started to attend the kindergarten as he hasn’t reached the age of attendance. He spends his time playing at home with his toys and his favorite ones are car-toys he drives around the room. His future dream is to play in the football championships and be a well known player. Elsi attends regularly twice a week, every Tuesday and Friday our feeding program at Katjel, enjoying the combined meals cooked and served to the participating children. He comes together with his mother to attend. Elsi likes the fried chicken, sausages, pasta and rice served by our cooks. He attends the Bible classes for the children who are same age with him and enjoys singing to praise the Lord Jesus and learning from God’s Word. At the end of the Bible lesson, he and the other children spend time to color or draw at our feeding centre under the care of our teachers. He also has the possibility to gain a free dental care offered at our dental clinic in Kotodesh. There are four persons containing Elsi’s family, living in a room in a new constructed home. He has a sister whose name is Elisa, seven years old. She is also attending our programme. The father has a vineyard and works on it during the whole time. He has got a small tractor to work in his vineyard and sells the grapes he is able to collect. He also makes raki (Albanian traditional alcoholic drink, served to guests) and sells a part of it too. The income is low but this is the only job he can do in the village. They have no animals and are in luck of products gained by them for daily consumption. With what he gets from the vineyard, the father manages to keep his family provided financially as far as in food and clothing. The mother cares for her young children and does the housekeeping.